The site of the battle of Flodden. 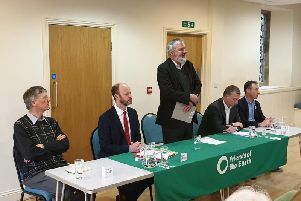 There was an excellent attendance for Till Valley Archaeological Society’s AGM, and more than 50 people attended the talk afterwards in the comfort of Crookham Village Hall’s roaring fire. President Chris Burgess was warmly welcomed back after his recent illness. Although the society is only four years old, it achieved a membership of 124 last year and already we have several new members this year. Tillvas was set up as a result of the early digs at Flodden when volunteers were keen to develop their knowledge and skills by practical activities and lectures. It is a cross-border organisation and its interests comprise the catchment area of the River Till and the eastern Border lands. John Nolan delivered an informative update on Flodden Hill work. The excavations, forming part of the Flodden Project, began in 2009 and some of the early trenches were re-opened last year for samples to be taken and further investigation. The samples are currently being carbon-dated. Each year has yielded new discoveries, although these have often been not what was anticipated. For example, a new trench in 2015 delivered two codd bottles marked Border Breweries, Berwick, which was operating in the late 19th early 20th century. Obviously the ground had been disturbed. Trench 5 on the eastern rampart of the inner enclosure on Flodden Hill revealed three curious stone features, possibly artificial fox-earths. Another trench nearby was riddled with animal burrows. Despite all the work, it has still not proved possible to date the inner enclosure. Richard Carlton dealt with other sites involved in the project. Norham Castle had already provided strong evidence of some form of industry, most likely lead working and the production of ordnance. It has been speculated that this area could have been the outer ward of the castle. Compacted cobbling was also found, as was a hollow-way leading to house platforms from the 17th/18th centuries. Results from Ladykirk were disappointing. Features were found to be the remains of 19th/20th century farm buildings. Mediaeval pottery was found on a nearby site. At Wark a surprisingly large wall was uncovered between the castle and St Giles’ Chapel sites. The Flodden Project is now turning its attention to Routes to Flodden, the passage of the Scottish army as it assembled from various parts of the country. Further work will focus on the Staw Road from West Newton to Yetholm and locating the site of St Ethelreda’s Chapel. Richard also spoke about the test pits dug by members at Crookham and Branxton. The audience greatly appreciated these reminders of work carried out, which surely must have whet the appetite for this year’s excavations.